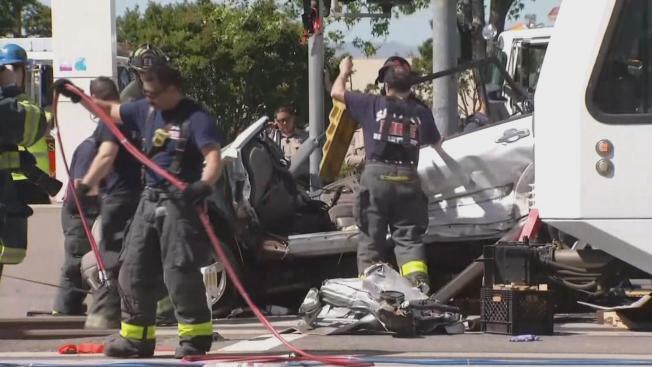 Emergency crews on Monday spent more than two hours extricating a driver from a mangled car after he collided with a Valley Transportation Authority light-rail train in San Jose, according to officials. It is unclear what led up to the violent crash, but first responders found the car pinned against a small concrete wall by the train near the Capitol Square Mall about 8 a.m., according to fire officials. Trauma surgeons had to sedate the driver in order to extricate him from the disfigured car, fire officials said. At one point, emergency crews even considered amputation because of the driver's condition and the contorted status of the car. "No matter how much we pried and pulled away the metal and plastics, he was still stuck inside that train," said Capt. Tim Miller, San Jose Fire Department paramedic team supervisor. "It was a very narrow space." The driver, who was conscious and talking to emergency crews during the rescue, was eventually removed from the car and transported to a hospital with injuries not considered life-threatening, police said. All eight passengers riding inside the train were not hurt, VTA spokesperson Linh Hoang said. For much of the day, a bus bridge was set up between the Penitencia Creek and Alum Rock stations to help commuters navigate around the scene, Hoang added. Full service was restored Monday evening.